Provide complete information on cost, service levels, and support for comparative evaluation of physical, virtual or cloud resources; and enable quotes and "what if" scenario modeling for optimal infrastructure investment decisions. I thought I'd provide some context as to what this offer is intended to do. I believe the actionable service catalog is the key to deliver infrastructure as a service that's predictable, variable and competitive. This objective is aligned with one of the big initiatives that still funded in most IT shops: virtualization. Virtualization requires standardization and packaging; these are the jobs of the service catalog. Particularly from the point of view of service catalog practitioners, I believe this type of offering can put your project in the high priority list for this year. Virtualization has a big pay off, but it still requires we coordinate different silos, and that we define our services to achieve the promised savings. The purpose of our FrontOffice suite is to accelerate and control the adoption of virtual and cloud environments by providing all the elements that an IT infrastructure group needs to provide their customers a business view into their internal private clouds. These include a self-service catalog, governance and controls, account management, resource consumption, service level reporting, billing, and planning. We are also delivering out-of-the-box automated provisioning VMWare and Amazon EC2 instances with full lifecycle tracking: requests, changes, termination. We'll add other clouds and virtualization technologies over the coming months. The picture below shows how the service portfolio and catalog it at the center of the dialog between Relationship managers, Business Units, and the App Dev teams. By defining a standard set of packages with all proper controls, it's now possible to orchestrate the delivery and provisioning of those services. Because those services are well defined, including the entire "bill of services" (monitoring, SLM, etc) a clear consumption picture is delivered to the business. Our goal is shorten the provisioning cycle time to minutes instead of months, enabling faster time-to-market for new applications. This will help IT drive demand to lower-cost virtual and cloud options, while preventing sprawl by decommissioning unused resources (decommissioning has an awesome payoff but you have to know what you have). It will also reduce risk through governance and controls, ensuring compliance with architectural standards as well as operational policies. As I've written before in "Amazon Has Written Your Technical Services Catalog" Amazon Elastic Computing Cloud (EC2) is revolutionizing the whole conception of the data center. EC2 offers a standard set of packages, predictable and variable costs for server, network, and storage services that are provisioned within minutes. Compare this to internal processes and IT tends to fall short. For example, below is a screenshot of one of the modules. It's a view of the service lines and will guide the user (who is app dev in this case, not an end user) to the right choice. The purpose of our FrontOffice for virtual data centers is to enable IT and managed service providers to build their own private clouds which can support all the IT processes that precede just ordering. My view is that as IT runs more and more as a business, Amazon is not only a competitor, but a model of how to present and deliver infrastructure services to its customers while adding the controls, policies, governance needed so we obtain the both of both worlds. Call this vision the private or internal cloud. In the private cloud, we want to enable automated provisioning, but we need to do a whole bunch of steps, such as run through approvals, determine storage requirements, determine security requirements, determine backup and restore requirements. And we still need to go through our steps for change management, access management, and service level management. Why do we need another tool? Existing data center automation tools only manage the technical and machine aspects of provisioning. Vendor-specific tools are limited to proprietary technology (i.e., VMware only works with VMware) at one layer of the stack. They don't address the need to coordinate and integrate other silos such as network, storage, middleware – nor do they provide operational support or governance. Also these tools don't cover other virtual or physical resources within the data center. So while they are useful part of datacenter operations, they are not going to help you in providing your infrastructure as a cloud. The whole point is to avoid the Spiral of Death. Starting a server in hour is not as useful if the process still takes 3-6 months. 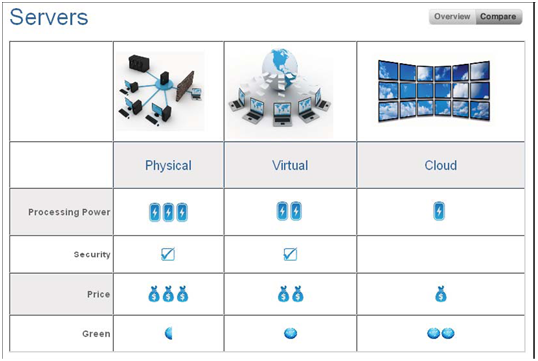 Most IT infrastructure operations are already virtualizing servers. But they may not be aware of the changes afoot. Its customers and app dev teams are already using the cloud for testing, evaluation and non-mission critical applications. Managed service providers are offering or preparing their own Private Cloud offerings. Soon they will be calling on your CFO and offering X package at $Y/hour on a variable cost basis. There's a meaningful short-term payoff in putting a FrontOffice for your data center. Some customers are able reduce the process from 600+ steps over months to 10-12 and 5-7 days. That's a huge labor savings. By tracking lifecycle, you can eliminate hundreds of physical servers and all its attendant costs. Another company reduced storage cost by more than $10M by better tracking storage requirements to a service view (there's a huge amount of duplication that's completely tied to lifecycle and compliance: bring visibility and bring savings). In today's environment, those are high impact benefits from putting an actionable service catalog to work with your virtual data center. I highly recommend a demo to see how this whole process works.